What Matters? 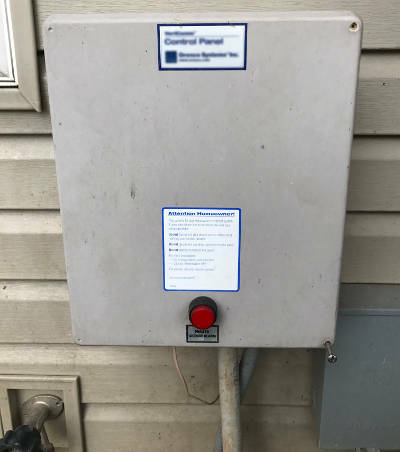 Grinder Pump Or Plumber In Branson Who Installs It? Home » Blog » Sewage Articles » What Matters? The Grinder Pump Or The Plumber In Branson, MO Who Installs It? Could It Be Both? If you’re a homeowner who lives in Branson, MO or near Table Rock Lake and you’re not on a septic system, there’s a good chance you have a grinder pump. When it comes time to repair or replace your pump, you’ll likely want to research the different types of grinder pumps to determine which one is best suited for your application. Alternatively, you may only care to find out which plumbers in Branson install grinder pumps and leave the decision up to them. Both of these factors are important, but how will you know which one is the most important? In this article, we’ll be covering some of the more common issues with grinder pumps as well as why you may want to reconsider which plumber you hire to make the repair or installation. Does The Type Of Grinder Pump Matter? In order to answer the question…What is the best type of grinder pump to install for my home? 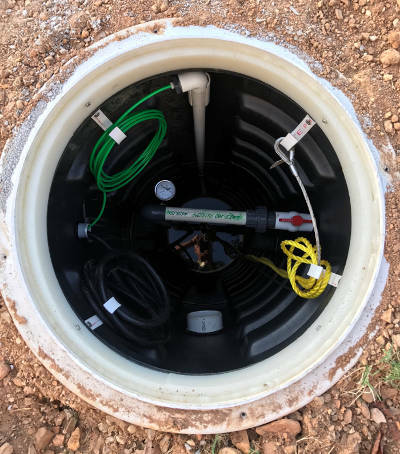 You first need to understand that just like a septic tank and lateral lines, which make up a septic system, a grinder pump is also a system within itself as well. There are many variables that determine the functionality and performance of your grinder pump. In fact, the pump itself is just one of many components that determine how long your pump will last as well as whether it will perform optimally or have limited, subpar performance. In order to give you a better understanding of this, the following includes the main components that make up a grinder pump system. Your grinder pump is operated by an electrical control panel. A basic control panel provides limited functionality, such as turning the pump on and off using mechanical components. The basin is what contains your pump and all the components that attach to it. The basin is fed by the electrical wiring, the incoming plumbing line and also connects to the outgoing plumbing lines, which disperse the liquid waste. In most cases, materials and products utilized by service professionals are made by a manufacturer. All that is required of the service professional, or in this case, the plumber, is to go to their local plumbing supply store and pick out a pre-packaged set up, take it to the job site and then, finally make the repair or replacement with the components that were provided. As a homeowner, you might expect this type of scenario where the plumber goes and picks up what they think they need and then installs it usually by replicating what was already there. After all, everyone else in your neighborhood probably had theirs installed the same way, right? Well, this example is what leads to problems from both, the plumber’s lack of knowledge and the manufacturer’s “off the shelf” grinder pump system not functioning to its fullest potential. So, to answer the question…“Does the type of grinder pump matter?” Yes, it does, but you also need to be aware that a quality brand of pump isn’t the complete solution. The grinder pump is only one part of an entire system. Therefore, everything including the control panel, programming, pressurization, wiring, plumbing grades, elevations, soil compaction and the electrical power source are all components that need to be engineered with sophistication to allow your pump to provide years of reliable performance. Does Your Plumber Understand The Grinder Pump’s Performance Capabilities? For the average homeowner, most assume that any plumber is capable of installing a grinder pump. When it comes to replacing one pump for another that may be true, but ensuring that it performs optimally may or may not be the case. As we’ve mentioned above, there are many factors that go into the performance and reliability of your grinder pump. Let’s cover them in greater detail. To keep this explanation somewhat simple, we’ll use a vehicle as an analogy for your grinder pump. One thing to keep in mind is that your grinder pump has a motor in it just as your vehicle does as well. When you drive your vehicle in excess of its limits, for example, if you have a stick shift (manual transmission) and you rev your vehicle’s tachometer into the red, you’re putting your vehicle at risk of blowing up the engine. The same holds true for a grinder pump. It also has limits that it must stay within to ensure it maintains a long life of operation. However, with a typical store bought grinder pump, this is something that cannot be accomplished, thus leading to regularly required replacement. Another common overlooked aspect includes how the pump’s dispersement is pressurized. No two grinder pump installations are the same. Each have their own unique environment that includes the exiting plumbing lines (the pipe that disperses the waste) and these lines may run up or down hill or a combination of both. Determining the pump’s pressure and flow needs to be evaluated accordingly and adjusted as such so the pump will not overheat and fail. No standard grinder pump systems have the capability of adjustable pressure and flow. With the exception of a few, like us, there aren’t many plumbers who also specialize in excavation. Because we have experience and knowledge in excavation, we understand how to install all plumbing related components that ensure your pump performs optimally. When we are hired to perform a repair on a grinder pump we can use this knowledge to determine if your plumbing grade or elevations are the cause of your pump failing. If you work with a plumber who has little to no knowledge in this aspect, you might simply be replacing your problem with an identical one later on down the road. As we’ve mentioned, the pump is controlled by the control panel. The control panel encloses a variety of wired connections, all of which control some type of the pump’s functionality. If you’ve ever heard your grinder pump alarm going off, this is one of those types of functions. Other types of electrical connections within your control panel must have an adequate supply of power. If your plumber doesn’t have experience with wiring or power supply requirements, your pump will probably fail at some point in the future. Believe it or not, it is possible to have the wiring configured incorrectly and the pump will continue to operate marginally, but not for long. Incorrect wiring procedures are one of many prior installation errors we notice when we are called to repair a pump. Want a plumber who understands your grinder pump’s capabilities? Don’t get us wrong, we understand that there are many qualified plumbers in Branson. However, most of them focus on a variety of other types of services. We are constantly called to repair existing grinder pumps due to what could have been easily prevented had they been installed correctly to begin with. At Envirotek Systems, we take great pride in our years of experience in dealing with grinder pumps. This experience has allowed us to develop our own grinder pump system, Visi-Pump. Visi-Pump is our line of control panels and sewage pumping systems. We’ve engineered it to work with all types of sewage pump systems, specifically grinder pumps. Visi-Pump comes with a residential 10 year warranty that includes all parts, material and labor so you’re fully covered! Because we manufacture Visi-Pump ourselves, we have designed it to excel under all conditions that give your pump a dominating performance that’s accompanied by a very long life span. 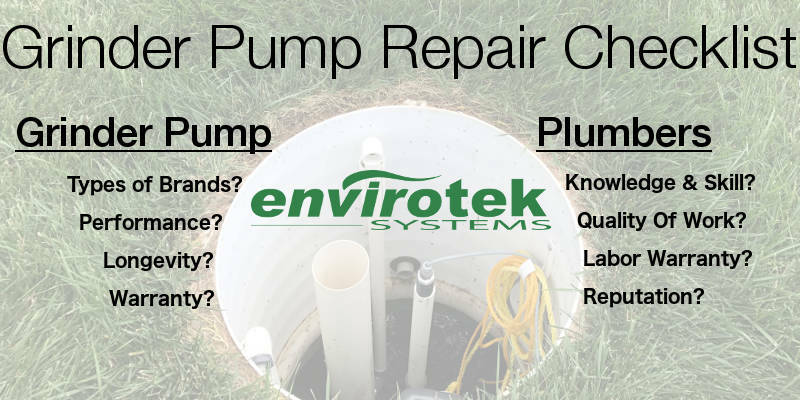 If you’re tired of replacing your grinder pump every few years, trust Envirotek Systems to offer a permanent solution!